Amy Cao makes cooking accessible to everyone, and she's bringing that concept to CookingChannelTV.com. Amy Cao, creator and host of the YouTube show “Stupidly Simple Snacks” and creator of website Amy Blogs Chow, loves food, and she wants you to love it, too, no matter your knowledge or ability. Her “Stupidly Simple Snacks” videos guide viewers through creating a basic snack, such as deviled eggs or banana pudding, and each episode garners millions of views. Her Tumblr page, where she shares everything from restaurant reviews and music to pictures of her pets, has over 150,000 followers. 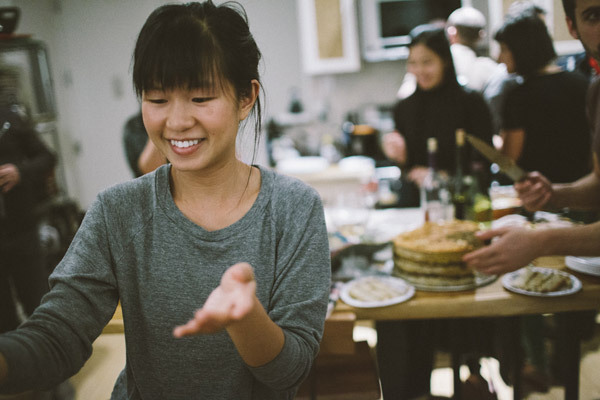 Despite this foodie fame, Cao wants to make one thing clear: she can’t cook. But she also wants to show her viewers and followers that it’s possible to love food without being a good cook, and that even basic recipes can produce nourishing food. Cao, who also works as a freelance social media and marketing consultant, believes everything about food — the ingredients, the people who make and serve it, the stories behind it, and whom we consume it with — are not only important to our relationship with it, but also that enjoying food doesn’t have to be inaccessible. Dumpling recently spoke with Cao about her experiences with food, cooking, music and family. DUMPLING: What first got you interested in food and cooking? AMY CAO: I can’t really cook, but I can see why people love cooking. I enjoy what food means and what it does. I love the idea of spending a long time with a friend over a meal. I live in New York City, and there are so many options for good food here. I have my regular coffee place, and I live near a great sandwich shop and a good Thai place. I’m also lucky because my boyfriend loves to cook, so when we do eat at home, he does most of the cooking. I like taking care of other people, which I primarily do not by cooking but by making sure people are happy and well-fed: ordering pizza, keeping wineglasses full, and cleaning up when other people cook. Cooking and food can be very family-oriented. Did your family influence your cooking or food preferences? My mom came [to] the U.S. from China when she was 28, so she had grown up learning to make Chinese food. As a result, when I was growing up, foods that were new to me were also new to her. We experienced new foods together. My mom would take me to different restaurants and then try to recreate what we’d eaten when we got home, except it was her own Asian interpretation of these dishes. For example, pancakes and other cakes in Chinese culture aren’t as sweet as they are here, so there was always a big discrepancy between what she made at home and what we’d buy a pastry shop. I learned to accept all types of food because of my parents. We didn’t have a lot of money, and to my parents, there was no such thing as a bad food, everything was just food that fed us. As a result, I learned to be very accepting and open to new things. But thinking back about all the Twinkies I’ve had in my life, I sometimes shudder. Do you think being Asian American has influenced your relationship with food? Yes. Going to a Chinatown supermarket was stressful to me growing up — Sunday is the day every Chinese person goes to Chinatown; they make a day of it, get dim sum, stock up on ingredients, and socialize. My boyfriend and I now go for fun. My boyfriend isn’t Chinese, but he’s obsessed with Szechwan-style cooking. Suddenly, the cupboards in our apartment are filled with all of these Chinese vinegars, spices, and sauces that I had in my cupboard as a kid. When I was growing up, I was the only Chinese person in my school from pre-k through 8th grade. Even though the kids didn’t make me feel different, food made me feel different, though. My mom would send in egg tarts for me to share with the class on my birthday instead of cupcakes. Of course, I appreciate my Chinese heritage now, but kids don’t want to be different. These days, it’s cool to stand out, it’s cool to have an experimental palate and try different foods, and even Chinese cooking has become trendy. But when I was a kid, I didn’t really want to stand out. Who are your favorite food writers or bloggers? Joy Cho, who runs Oh Joy! is a favorite. She’s a lifestyle blogger, so she talks about restaurants, travel, design and recipes. I like bloggers who talk not only about food, but also the story behind it. My favorite food-related book is Blood, Bones & Butter by Gabrielle Hamilton. It’s a beautiful, exquisite narrative about a Hamilton’s life and her experiences working in kitchens and opening her own restaurant in New York City. She got a degree in writing, too, so it’s interesting and well written. More people should read this book! I’ve noticed that you also write a lot about music on your Tumblr and frequently feature songs by lesser-known artists in your “Stupidly Simple Snacks” videos. Do you have any interest in music besides listening to it? Music tells a story, and it can so perfectly capture a mood, which is why I share the music that I share. I try to post music that will make someone feel what I feel; I want people to know they’re not alone. My blog has a relatively young following, with many followers in their teens. I don’t write about really heavy stuff on my blog, but I still get emails and messages from people thanking me for writing about different issues because they can relate to them. One example was when I posted a bunch of photos of me and my boyfriend, and people wrote comments asking things like why I wasn’t dating someone of my own ethnicity. I usually ignore the trolls and spammers, but this time I felt compelled to respond, so I wrote that it’s not OK to leave a racist comment on my site. I want people who experience racism to know that they’re not alone in it. Your “Stupidly Simple Snacks” videos focus on easy cooking. How do you think sites like YouTube are changing how people cook? Cooking shows have traditionally taken place on sound stages where everything’s perfect and the ingredients are pre-prepared. That style didn’t appeal to me because I have to cook for my own life. I love how imperfect cooking can be, which is why I love “Stupidly Simple Snacks,” and what I try to convey in the episodes I make. On the show, I’m cooking in real time, so I try to convey this, even if it’s sped up, like showing what I do while I’m waiting for my ice pops to freeze. A lot of people who watch my videos don’t believe I can’t cook, but I make them to show that cooking can be approachable to anyone. It’s funny when I screw up, so I try to show those screw-ups in the videos. You don’t have to be a foodie to enjoy food and cooking. What are your plans for the future? Do you think you’ll continue to write and make videos about food? I’ve been working [with] the Cooking Channel making new episodes of “Stupidly Simple Snacks.” I filmed 10 episodes in the last three weeks that will premier this summer. I used to make all my episodes on my Macbook, but this time I worked with a production company that had real cameras and lights and made the videos look very professional. Whatever I’m doing in the future, I want to help people relate to each other and contribute positively to the world. Life is short and people often forget that. I want people to remember that at the end of the day it’s OK, you can pick yourself up. I also want people to know that you can love food without knowing how to cook. Find Amy at amyblogschow.com or on Facebook or on Twitter @amycao. You can also check out her YouTube Channel, “Stupidly Simple Snacks.” youtube.com/stupidlysimplesnacks. Photo: Eddy Vallante for Amy Cao. Whitney Donielson Whitney grew up in Oregon and got her degree in English at University of Oregon. 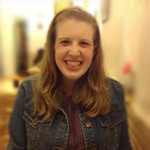 She currently works on an educational farm in Northern California and loves writing, reading, hiking, martial arts, cooking and hanging out with the goats and ostriches on the farm. Find her at http://whitneymade.wordpress.com.